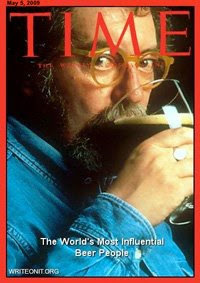 Jay Brooks has filled in the gaps left open by TIME Magazine, when, in its 100 most influential people issue, it neglected beer folk. He has created his list of the Top Ten Most Influential Beer People of the past 50 years. Read the Brookston Beer Bulletin for the next nine, and for several honorable mentions. For me, Number 11 should be the Unknown Beerist —standing in for all the brewers and other folk who have worked in the beer industry, usually without public acclaim, and in the case of craft brewing, often for small pay, to bring us great beer. I would like for the beer drinker to be Number 11 on the list. If it wasnt for them, the list wouldnt even be there. The beer drinker is influential on what sells, and what is brewed (if they don't buy it, the brewer wont make it- normally). But it is a good list, nonetheless. I missed this. I hope I can find one someplace. It's sad that we have lost the most imnportant beer advocate in the world.